Thursday the 25th was a gorgeous day. Jim had an 8:00 a.m. truck service scheduled, so we tried out another local eatery after dropping the truck at the Dodge place. He had been wanting to visit Fort Scott, Kansas, so after picking up the truck, the three of us hopped into the car and headed north and west. When we arrived in the town of Fort Scott, we stopped at Sugarfoot and Peaches BBQ to grab a lunch we could eat outside at a picnic table. We located a small park near a stream with a picnic table in the shade and a short walking trail. That suited the three of us perfectly! The food was good and the exercise after eating was both relaxing and needed. Here’s a picture I made looking up as we walked; it gives an idea of how lovely it was. 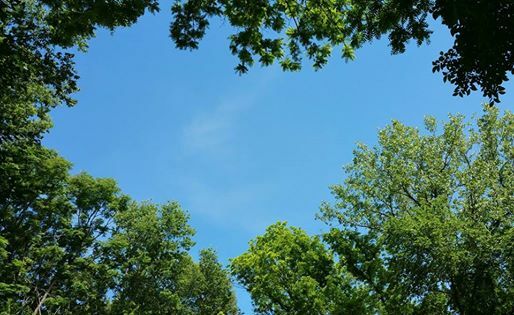 The bonus is that the trees formed a heart shape. Chewie writes about visiting historic Fort Scott here. Friday, Chewie had a vet’s appointment. The old man is getting some joint pain (he’s almost 11 years old), so he got his first steroid shot to help with the discomfort. After that, we did things around the camper. Saturday, however, we three were out and going again. I’d wanted to visit the Webb City Farmers’ Market; it is open three days each with with varying hours. For Saturday, it’s hours were 9 to 12, so we got dressed and went. I’m so glad that we did. Here’s the link to the post on the market. 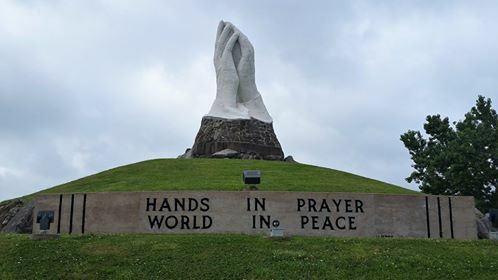 From the location of the market we could see the praying hands shown below. After seeing them from afar, I remembered Koral Martin, our new photographer friend in Carthage, had told us about them. Of course, we had to check it out. It is a really nice reminder of our need to pray and our hope for peace. Sunday the 28th, Chewie had a much needed “spa day” appointment at PetSmart, so while he got groomed, Jim and I had lunch and did a little more shopping. Sunday evening, we attempted to attend another movie at the Route 66 Drive In with friends, but before we could get to the gate, the movie had sold out. The re-group was a visit with Susan and Craig, and then the four of us went to Joplin to see the same move at the indoor theater. It was a fun by very late night. On May 30th, Jim, Chewie, and I made the hour drive to Wilson Creek National Battlefield near Republic, Missouri. 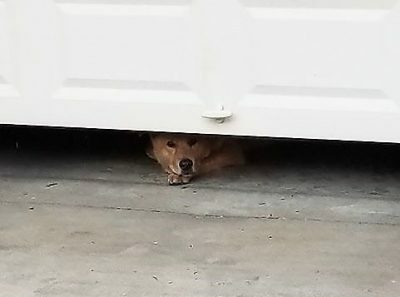 It was a race against the rain, and I think Chewie will be writing a post about the visit there, so I’ll post a link here when he does. 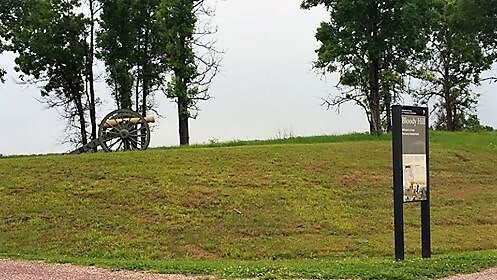 It was very interesting, and even as Civil War history buffs, we learned some new things during our time at this park site. 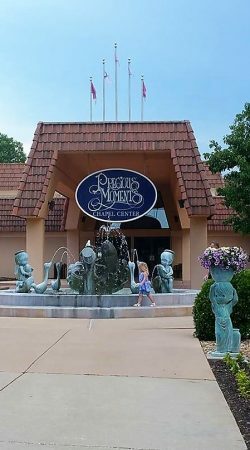 The next day, Jim and I finally made it over to the Precious Moments Chapel and Gift Shop. It was much larger than we expected. Once again, we were racing bad weather. Otherwise, I could have enjoyed the chapel tour and the atmosphere of the chapel and gardens. After Jim grabbed a haircut, he and I met our friends Susan and Craig once again at Turtleheads Raw Bar; it was all-you-can-eat crab legs that the guys enjoy. Following up with ice cream after made it a bit later night than planned, but it would be our last visit with these friends for a good while. Thursday was a long travel day back to Tennessee. We made it to Savannah early enough to take care of some necessary business. Then we crashed at the La Quinta in Decatur, Alabama. We did not know how late we’d be, so we took advantage of a free-night’s stay. Next morning, we invaded Dad and Nancy’s. Jim and Chewie hung out with them while my brother and I took Mom, who lives in Tennessee, to have some medical tests. Once back to Dad’s, we enjoyed visiting with him and Nancy until time to head to Hershel’s first birthday party held at the newly purchased Bossert Farm in Giles County, Tennessee. (The Bosserts are Hershel’s other grandparents, and they’ve recently bought a mini farm in my home county in TN.) Though Hershel was not feeling well that morning, it ended up being a wonderful family gathering for his first birthday. Thanks Susan and family for hosting it. Chewy is a party dog! After the party, the three of us drove tag-team (though Chewie declined to drive) all the way back to the camper. Now, we’re prepping to move to Kansas in just a couple of days. Yay! Jim and I have had “hitch itch” badly; we’re ready to roam again.